Do you have a canine companion who is hard to please? Before you assume that your dog is snubbing your best intentions on purpose, perhaps you should investigate what is in the food and treats you are offering them. Loyalty Pet Treats offers only the finest healthy chicken dog treats which are likely to appeal to your dog’s finicky palate. Our treats have all the protein and nutrition that dogs need, and none of the additives and preservatives they don’t. Satisfying Your Picky Eater with Natural Chicken Dog Treats. It’s a simple fact that some dogs seem to be pickier eaters than others, and this can also apply to the kinds of treats your dog will accept, making training your dog potentially challenging. You want to find a high reward treat that your dog will love and want to work for, yet it seems like no matter what you try she isn’t interested. What’s a responsible dog owner to do? After taking your dog to the vet to rule out allergies or other possible health issues, you should try offering some high quality natural chicken dog treats with recognisable ingredients that your dog is more likely to accept. One of the reasons your dog may be so fussy could have something to do with her wonderfully sublime sense of smell, which is likely to be at least 1000 times more potent than yours. When it comes to most sources of food, she can tell using her nose whether a treat is fresh or if it contains a strange and unappetizing ingredient. Conversely, she may be particularly drawn to very powerful and intense aromas that excite her delicate sense of smell. That’s why our healthy chicken dog treats could be the answer you’ve been looking for! Another reason your dog may be picky could be that they long for variety. If you’ve been feeding your dog the same food and treats each day, it may be time to switch up the routine. Instead of trying the same old dog biscuits to no avail, you should consider our chicken dog treats from Loyalty Pet Treats for a change of pace. Natural chicken dog treats such as our 100% Australian Chicken Meat treats are chewy but easy to break into smaller bits, perfect for training. With its intense flavour and aroma, your usually fussy dog will likely soon be begging for more. Our patented Nutriseal ™ process delivers ten times the nutritional benefit of raw meat alone. That’s why our healthy chicken dog treats aren’t just delicious; they are also better for your dog than many other commercially available treats. All our products are 100% Australian made. We are the manufacturer of our own pet treats, so we know exactly what goes into each product. When you buy from our online store, we can ship our high-quality treats throughout Australia. We also offer free freight on all orders over $220. 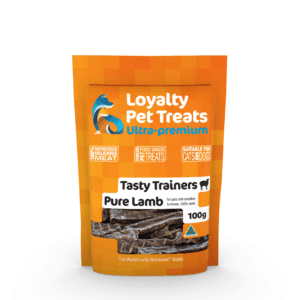 If you have any further enquiries about our chicken dog treats or any of the other excellent pet treats we have available, be sure to contact Loyalty Pet Treats to find out more.